Tsubaki Nekoi (猫井 椿, Nekoi Tsubaki, born January 21, 1969), formerly Mick Nekoi (猫井 みっく, Nekoi Mikku), is a member of the all-female manga-creating team Clamp. She is the co-director and her duties in the team include applying screentones and correcting manga illustrations. She was also the lead artist (a role that normally falls to Mokona) on Legal Drug, The One I Love, Wish, Suki and xxxHolic. As the lead artist in xxxHolic, she is in charge of drawing the male characters while Mokona is responsible for the female characters. 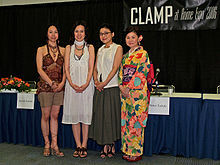 For Clamp's 15th Anniversary in 2004, she and the other three members of Clamp changed their names because they reportedly wished to try new monikers. ^ Petersen, Robert (2010-11-18). Comics, Manga, and Graphic Novels: A History of Graphic Narratives. ABC-CLIO. p. 184. ISBN 978-0-313-36330-6. Retrieved 24 May 2011. ^ Chang, Chih-Chieh (March 2, 2006). "Interview with Ageha Ohkawa and Mitsuhisa Ishikawa". Anime News Network. Retrieved 2007-10-15. This biographical article about a manga artist is a stub. You can help Wikipedia by expanding it. This page was last edited on 26 December 2016, at 04:51 (UTC).